Matt Taylor is a Brooklyn-based writer whose political reporting has appeared in Slate, Salon, The New Republic, NYMag.com, Capital New York, The Atlantic, The American Prospect, and Vice, among other publications. You can follow him on Twitter @matthewt_ny. 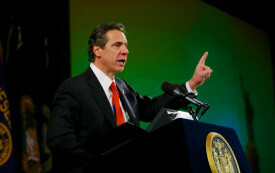 Is the New York governor’s modest concession an attempt to duck the big-picture problems with racially discriminatory marijuana arrests?